Working within the property sector you will be privy to some of your client’s most intimate secrets which is why it is important you uphold their confidentiality. The property profession is one of very few professions where there is a tight bond between the client and the agent. In many cases you will be looking after your client’s interests financially, so you will need to delve into their salary details, bank accounts and even their medical records. It is important that you respect your clients and don’t go telling everyone you know the ins and outs of their personal circumstances. You will soon get into trouble if you are found speaking about your client down the pub when out with friends.When you start your career in property and deal with your first client you will be expected to sign a confidentiality agreement and abide by the codes of the industry which will normally come under the Royal Institute of Chartered Surveyors who will expect you to respect your client’s private details. Working in the property market you will come across some large-scale property deals and could find yourself handling property transactions worth a couple of millions of pounds. You will be expected to act in the same way as a doctor might towards their patient. If your client is looking to bid for a property they will need to show where they are getting the money from and how they intend to pay for it. This means that you will have access to their bank details, any debt they have and what their salary is.If the client is looking to borrow a large amount of money then you will also need to have access to their medical records and make sure that they have undergone a health check before they can borrow the money. If you are working in a small community the chances are that yourself or someone you know will be friends with your client or be acquainted with them. Even if you find out your client is seriously ill and they have not told their family about it, you will not be permitted to talk about the details. A job in the property market is never dull and who and what is buying property always creates public interest. You may even find yourself with a few celebrity clients or working on a large scale property development with a secret buyer. If you find that your client plans to demolish a housing estate to build a supermarket you may also find that your client becomes public enemy number one. In all of these cases you may find that you get interest from the press who will want to know about what your client plans to do with a certain property development or house. If your client hears that you have been speaking with the press on an off the record basis they will not be happy and it could cost you your job. 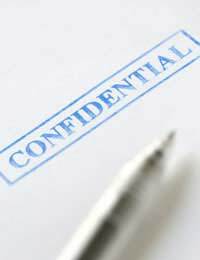 Breaking client confidentiality when working in the property market is not looked on favourably. Companies will pride themselves in being able to offer a discreet service for all of their clients, if your company gets wind of you bragging about your latest deal you could face disciplinary action and possibly even lose your job. If you are a member of the Royal Institution of Chartered Surveyors (RICs) and are found guilty of breaching client confidentiality then there is a good chance that they will throw you out of the institute. You should keep in mind what type of personality you have before entering into a career in property. If you are someone who likes to gossip with friends and would find it hard not to discuss your client’s details than a career in property is perhaps not for you. If on the other hand you feel you would be able to act in a professional manor at all times despite knowing the client involved then you should not run into any problems regarding client confidentiality while working in the property market.